↵GATORBACK: This is our top of the line, custom made, Gatorback Carpenter tool belt coming straight from the manufacturer! SIZING: For the best fit, MEASURE ACTUAL WAIST SIZE OVER CLOTHES! Do not just go off of normal pant size. BOX DESIGN: All of the pouches have a sturdy box design that is reinforced with a hard plastic lining. They hold their ​​​​​​​shape and provide the maximum space for your tools. RIVETS & BAR-TACK: All of the stress points on the pouches and belt are reinforced with bar-tack stitching and heavy duty metal rivets making the product rip and tear resistant. BACK SUPPORT BELT: Design patented air channels and breathable memory foam padding provide the most comfort, support and ventilation. COME FEEL the DIFFERENCE of the MOST COMFORTABLE TOOL BELT MADE. 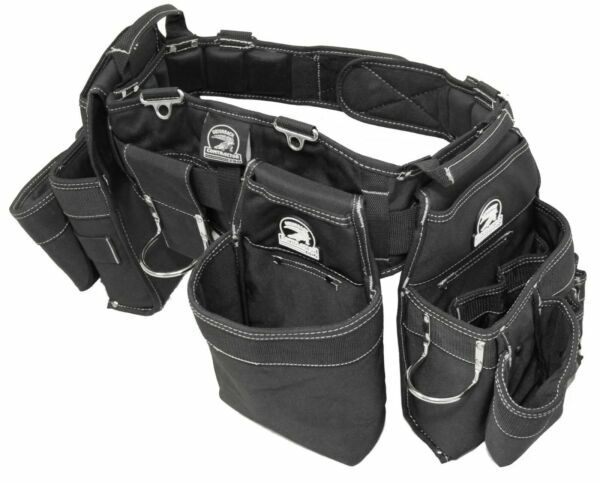 Inspired by a Gator's Back this tool belt offers incredible Comfort, Support and Ventilation. This tool belt features our unique ventilated padding to help you sweat less and with our memory foam padding it makes it breathe better and give you the most comfortable belt. The carry handles for easy transport and putting the belt on and taking it off. Plus each pouch was engineered to carry the tools of a professional Carpenter. And you don't need to worry about toughness because these belts are guaranteed tough with the reinforced box design with an inner hard plastic lining as well as rivets and bar-tacking at every stress point on the belt. All of Contractor Pro's Gatorback products are Guaranteed Tough and Always Comfortable! FREE Shiping and 1 day handling on ALL our products! $25+ orders get free Expedited Shipping! We guarantee our products quality by having each product individually inspected to ensure it meets our standards! Not quite for you? Send it back! Full refund 30 Day return policy on all unused items! If purchasing multiple items, please order at the same time so we are able to combine the shipping and get everything to you as soon as possible! We offer FREE shipping on all orders within the United States! For orders that are over $25 we bump that up to Expedited shipping! Your order will be dispatched within 1 working day of receiving payment (Monday-Friday) and you should expect to receive it two or three days after dispatch. If orders are under $25 shipping may take up to four or five days depending on your location. If you are not 100% satisfied with your purchase, you can return the product and get a full refund or exchange the product for another one (only applicable if there are multiple sizes).